Something many of us who grew up in decades past have in common is lamenting the reality that we didn’t hang on to our first cars of that era. When able to afford one of the latest models that manufacturers were rolling out year after year, we just routinely traded our “old” cars for the shiny newer ones. 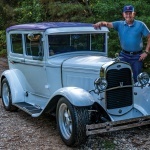 Looking back now at what have become collectible classics, we see that acquiring one of them again satisfies our passion of bygone days and allows us to get behind the wheel and relive our memories. 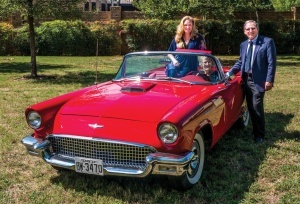 Bob and Brenda Woods did just that earlier this year when this pristine, first-generation 1957 Flame Red Ford Thunderbird came up for auction and they made the winning bid. 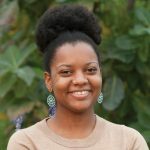 Their first one was white, and the family has a black and white picture that features their daughter Lori sitting on the top of the seat at age four. This was their Christmas card picture that year. The picture here recreates that scene. Bob, a longtime University of Texas at Arlington mechanical engineering professor and Formula SAE advisor, is one of Arlington’s most recognized experts in the automotive field. The most recent honor came through a gift from entrepreneur and businessman Paul E. Andrews, Jr., who established an endowed chair in Bob’s name to promote research, innovation and development of best practices in automotive engineering and design. Bob, who joined UTA’s College of engineering in 1974, founded the student racing program in 1982. The team has since won eight championships in the United States and international titles in England, Japan and Australia. 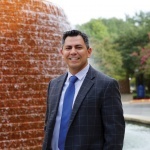 Bob has capped off a good year with winning the statewide Piper Professor Award for excellence in teaching and as a recipient of the prestigious Regents Outstanding Teaching Award. His 60-year-old ’57 Thunderbird takes its place in automotive history as a great example of Ford’s entry into the sports car field. 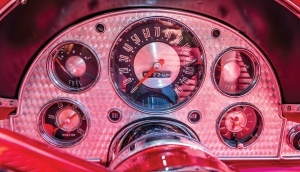 After World War II, foreign carmakers had found success in selling roadsters such as the MG and Jaguar to Americans. In an attempt to deal with the competition, Chevrolet rolled out its first Corvette in 1953. Ford followed two years later with the T-Bird, and by the time the ones like the Woods’ were produced the vehicle sported a reshaped front bumper, larger grille, tailfins and lamps. 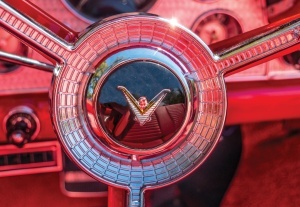 The Thunderbird was certainly sleeker than Ford’s “regular” models, more muscular in shape with features like a hood scoop and a 140-mph speedometer. 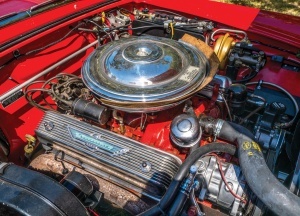 With a 312-cubic-inch, V8 engine and a four-barrel carburetor, horsepower reached the 300 mark, and Ford saw Thunderbird sales rise to a record-breaking 21,380 units for 1957. 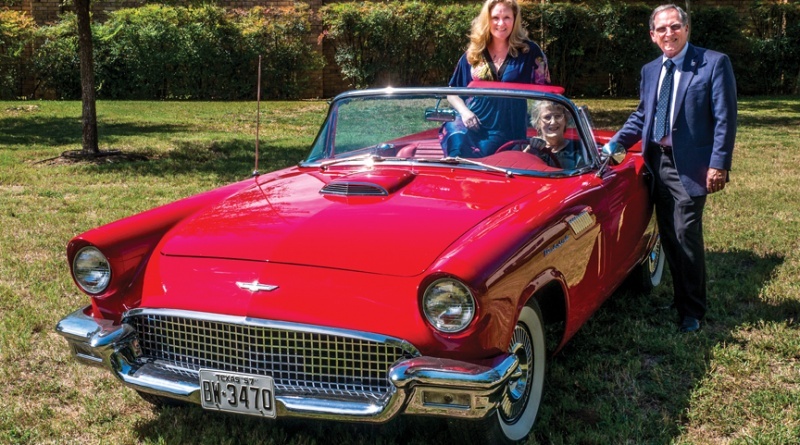 The second Thunderbird generation was ushered in the following year, and today’s models still carry the distinctive stylings that launched Ford’s iconic classic.